Posted on Monday, September 3rd, 2012 at 1:01 am by Ty Anderson. Excel 2013 has plenty of new features. From Flash Fill to PowerPivot’s native engine, from Quick Analysis to the WebService() function there is plenty to excite the user base. But for Excel developer’s, the biggest news has to be the new Apps for Office extension framework. Microsoft Excel has a long history of extension frameworks (e.g. VBA, XLLs, UDFs, VSTO, & COM). Each of these has their purpose and corresponding pros and cons. They work…and they work well. But Office (and Excel with it) is moving to the cloud. By “moving”, I really mean “embracing”. Microsoft wants Office to work seamlessly on devices of all types (no word yet if that means multiple operating systems too). This means Office apps need to work on the desktop, on tiny devices, and on the web. By embracing cloud technologies, Office give developers a framework for building extensions that work “across the board”…on the desktop, on the tiny devices, and on the web. This new extension framework appears like a no-brainer at first glance. You might even ask, “What took so long?”. If you do, I don’t blame you. But please note, that question is not part of today’s Q&A simply because I do not have an answer. Nonetheless, I’m glad to see this technology and look forward to building some solutions with it. 1. Will my current solutions work with Excel 2013? Probably. Best I can tell, Microsoft has not changed or deprecated any of our beloved client solution frameworks (VBA, COM add-ins, XLLs, EDFs, and VSTO). That’s the good news. The “less than stellar” news is that Microsoft did not enhance the existing frameworks. Sure, they have been extended to support new objects like the ones listed on the RAD Excel blog but there are no new features to write about here. So let’s move quickly to question #2. 2. What are Excel 2013 content apps and what are task pane apps? When you develop an app, the manifest file resides in the Office Store. When a user downloads your app, the manifest tells Office where your app resides. You can store your app on a web server of your choosing. After connecting to your app, Office displays within Excel. 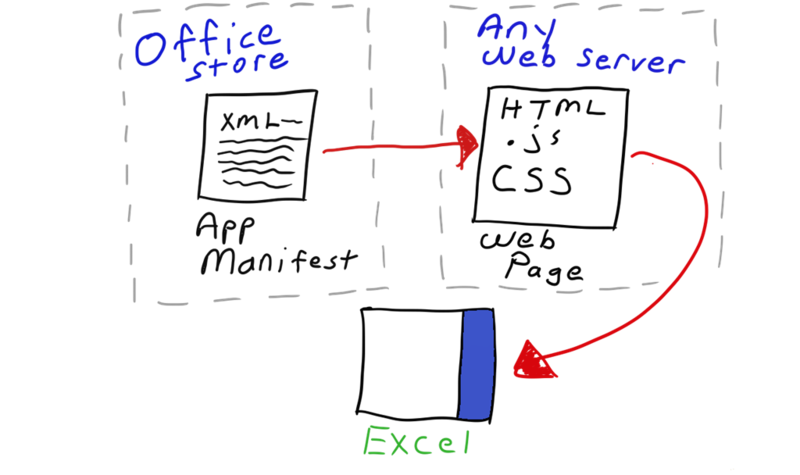 The illustration above shows an Excel 2013 Task Pane app. Using Excel 2013 Content Apps, you can take advantage of web technologies in real time. There is no need to wait for a new version of Excel to build support for it. Don’t like the chart types provided by Excel out-of-the-box? Build a content app that utilizes Highcharts JS. Need access to functions not offered by Excel or simply need them to act differently? Write your own and use a content app to work with the data in your worksheet. This is a brilliant move by Microsoft. Task panes reside next to the document, not in it. They are analogous to traditional Office task panes and should be utilized in a similar manner. The idea with Excel 2013 Task Panes apps is to give you a method for providing contextual help to users as they build or work with an Excel document. 3. What Excel objects can I access with using these apps? AsyncResult This object contains the result of a request. It will have the request status along with any errors. Bindings (& Binding) Contains a binding to a document section. You don’t call it directly or it will bark at you. Instead, you use one of the three supported binding types: MatrixBinding, TableBinding, or TextBinding. I figure these objects are where the rubber hits the road and will be used often. Document This is the document attached to your app. You call it like this: Office.Context.Document. Office Represents an instance of app, provides access to top-level API objects, and allows you to write a call-back function for the app’s Initialize event. Settings Every add-in or app needs this object. We don’t have access to the full object model. That stinks but I believe Microsoft is taking a solid step forward. Office is a COM-based system. The web isn’t and the web is kind of a big deal. Microsoft has to do something to integrate web technologies within Office. I’m hoping we don’t have to wait 3 years for Office.js to support more objects. 3. What other shiny new objects should garner my attention? Excel Web App – What’s now available in a browser near you? 4. Does Microsoft provide any guidance for how to design & build these apps? 5. What tools do I need to get going and build some “Apps for Excel” using the apps for Office model? 6. I’m having trouble getting my head around this concept, can you point me toward some useful, real-world type, demos? Ummm… maybe. It depends on how you define the terms “useful” and “real-world”. What I can do is point you toward some interesting demos. Will that do? I think the first item in this list comes close to answering question #6 in the affirmative. It’s early. Office 2013 consumer preview has been running in the wild for just over a month. But give it time and we’ll have better demos. By we, I mean Add-in Express. 7. Will you stop typing now and give me the link love? Absolutely. A lot more content exists than I can cover here. For deeper dive, follow these links… read the articles and keep on reading! Start Building Apps for Office :: Lots of lot of great links! Office 2013 and Visual Studio 2012 are supported by the new version of Add-in Express! Finally, after all these years they added a Hwnd! Yes, they have added the Hwnd property to the Window object (though it is not documented yet). It is not a secret to anyone that Excel 2013 is a “multi-windowed” host application now. This property will help us to work with Excel 2013 windows and workbooks. The images were linked directly from Microsoft’s web-site. And now, the images are not available any longer, so we have no way other than removing them altogether. Thank you very much for pointing this out for us. Need assistance. I’m trying to get last empty row in office 365 task pane app. But i dont see any api to do so. I’m currently adding data on a button click from task pane. What i see is on every next click data gets overwritten, or sometimes it throws error. The problem is that i have no api, where i can get my last empty row and then write from that particular row. I understand your question completely as I did the same as you. I was convinced I should be able to traverse the spreadsheet in usual way with COM Add-ins and VBA. However, you can’t navigate freely with the new Apps for Office extensibility model. You can only navigate within the cells currently selected by the user.